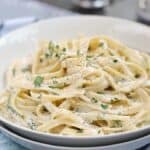 Greek Yogurt-Herb Pasta is a quick and easy meal full of flavor from fresh herbs and lemon that your family will happily devour! Chop the herbs and place them in a large bowl. Set aside. Bring 5 to 6 quarts of water and 1 Tablespoon of sea salt to a boil. Add pasta and cook according to package instructions. Remove 2 cups of the pasta cooking water before draining the pasta and set aside. While the pasta is cooking, heat 2 tablespoons of olive oil in a large skillet over medium heat. Add the onion and cook until softened, 5 to 8 minutes. Add the onion mixture to the fresh herbs, stir to combine. Whisk in the reserved pasta water. Add the drained pasta and lemon zest, toss to combine. Season with sea salt and pepper to taste and serve. I used Fage whole-fat Greek yogurt. I think they now call it 5%. Use any combination of herbs that you have on hand, or that are available at the grocery store. Add more or less, get creative. I used Barilla Fettuccine n.6 because it was hanging out in my pantry. Use gluten-free or whole-wheat pasta if you prefer. Substitute vegan yogurt for a vegan meal.